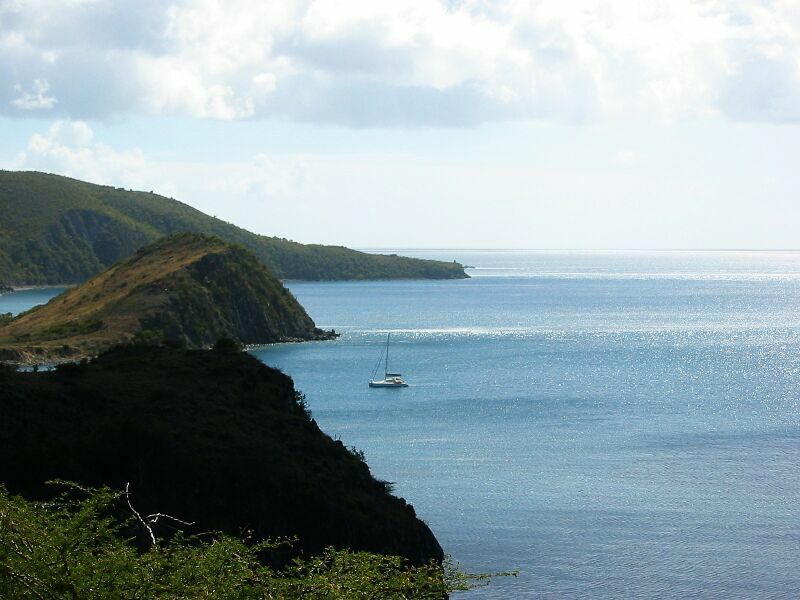 St. Christopher, better known as St. Kitts (an abreviation of St. Christopher), is a beautiful island just a few miles SE of Statia and about 20 nm south of St. Barts. Nevis, another island part of the same country (although you wouldn't know it from their customs procedures), is right next door with only 3 miles separating them with water only 22 feet deep. They actually have people who swim between the islands for fun. St. Kitts was the center of the sugar cane industry for a long time, and they actually still grow and process it there. 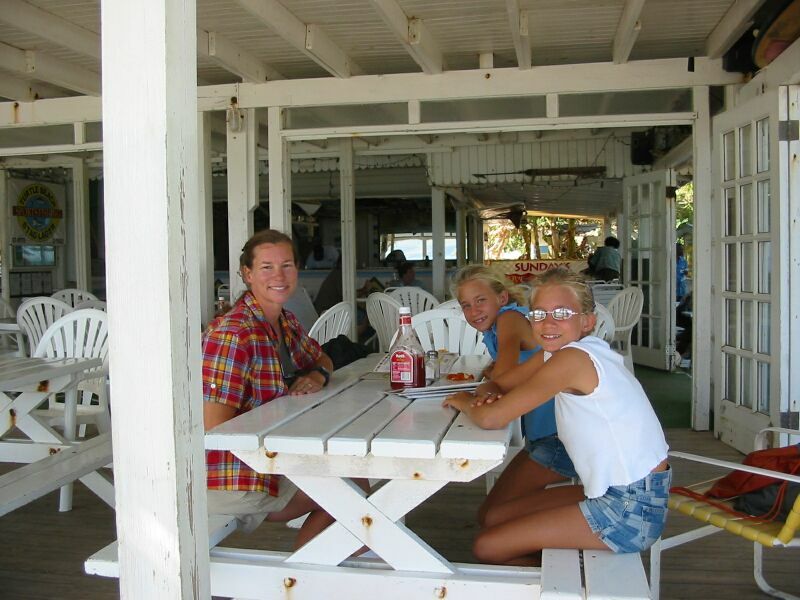 However, as with most of the islands down here, tourism is playing an increasing role for the island. In fact, they just finished a nice new airport terminal, and a large Mariott complete with casino, bungalows, beachview rooms, and a new 18 hole golf course - all of which will be opening in February. St. Kitts is also visited by numerous cruise ships throughout the season. PatiCat sailed from Simpson's Bay, St. Martin directly between Statia and St. Kitts on the west side. We chose to miss Statia on this trip due to time limitations. 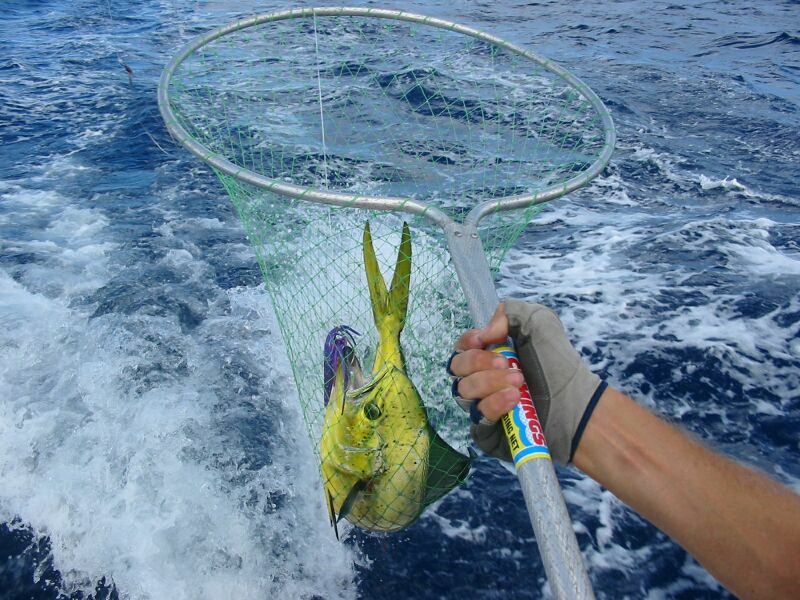 We had very good sailing conditions, and Frank had two fishing rods trolling behind the boat. 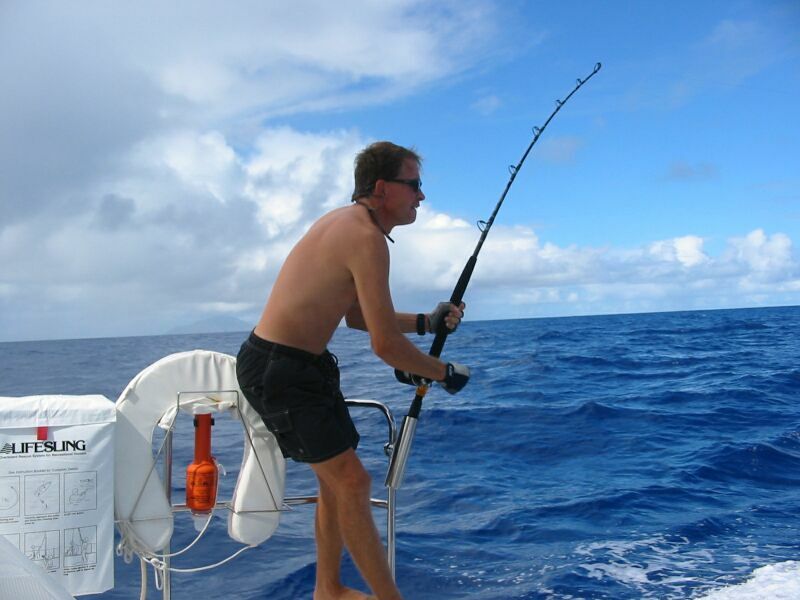 As we approached Statia, just as the winds were changing and Frank was changing the sails (of course), one of the fishing rods started screaming. Frank yelled for help and pulled on the rod. A large (about 4 ft long) fish jumped in the air, but a few seconds later the line went slack. Either the line busted or the lure or hook broke. Sigh. Meanwhile, the girls rushed to the other rod and Frank realized the rod was bending with another catch! 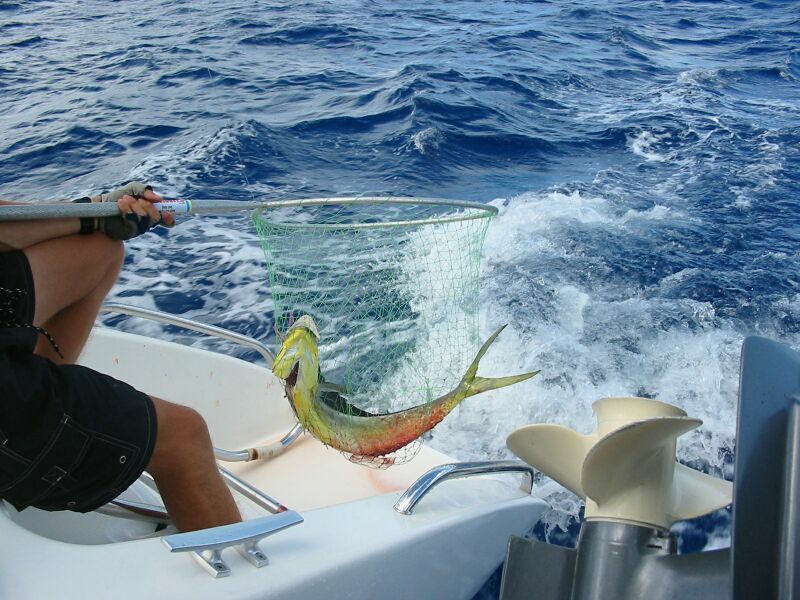 The Mahi Mahi probably weighed about 15 pounds, and later Frank managed to filet about 12 decent sized steaks off the fish. Three meals for all of us! As we sailed along the coast of St. Kitts, we were admiring the beautiful bright green crops of sugar cane and palm trees. You could easily see refurbished plantation estates and sugar mill ruins. We also admired the beautiful volcanic peaks surrounded by lush rain forest. Half-way down the coast we passed Brimstone Hill, an amazing volcanic hill stuck on the coast which is topped by an amazingly intact British Fort. More on the fort later. 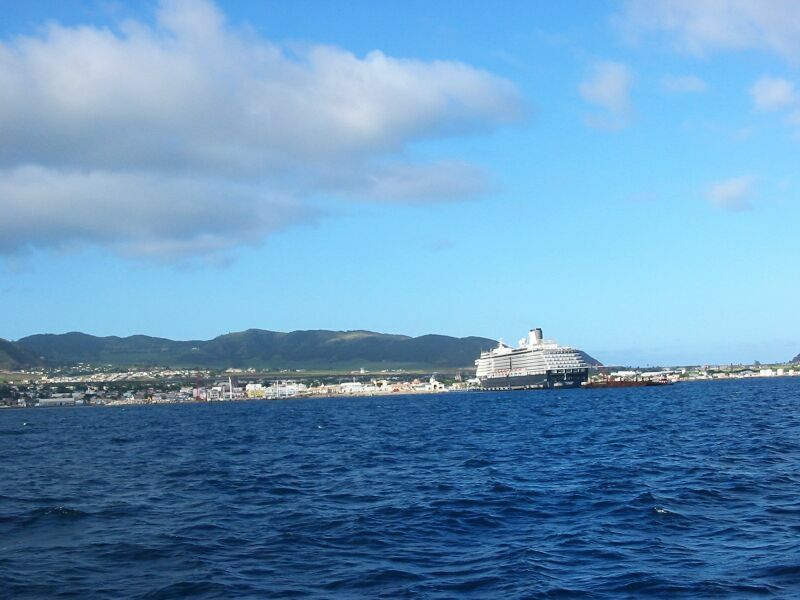 We arrived in Basseterre, the main port of St. Kitts, after numerous tacks down the coast. Our arrival time was about 5:00 PM, after a 9 hour sail, so we concentrated on the fish cleaning and grilling and put off customs until the morning. The anchorage was a bit swelly during the night, but not too bad for PatiCat. 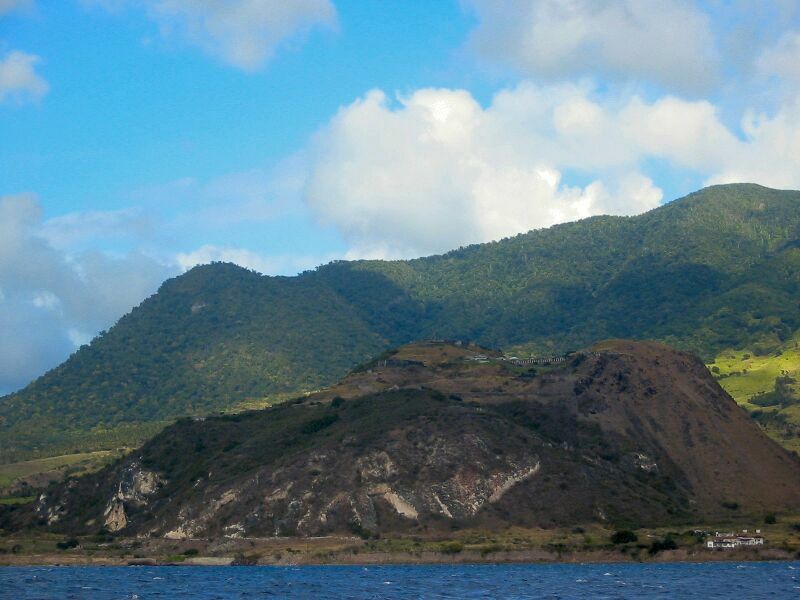 Here are pictures of St. Kitts on the way in. The second picture is of Brimstone Hill. The third is of BasseTerre complete with a cruise ship. We have been using a cruising guide called "The Cruising Guide of the Leeward Islands" by Chris Doyle. The guide is an indispensable reference to the area, and we often see other cruisers walking around with their copy. However, you have to realize the author relies on a combination of guide sales and advertising from every island he writes about. So, there is rarely anything negative written about the islands or the shopping. 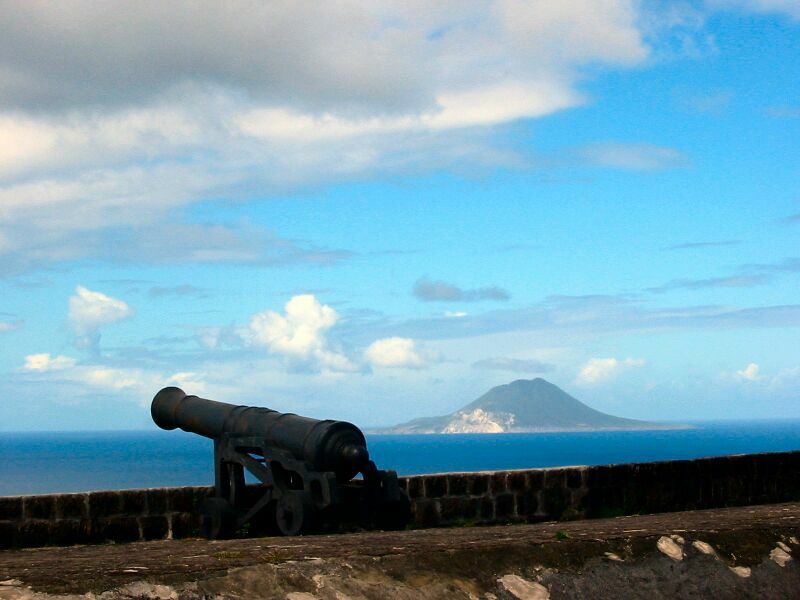 St. Kitts is a beautiful island to behold, but it leaves a lot to be desired for the visiting cruiser. While not exactly cruiser friendly, the people were very nice, and we mostly enjoyed our visit here. The island is beautiful to behold, and has a lot of potential. Right now, its focus appears to be on the cruise ship tourists and the new Mariott. To clear customs you have to anchor at Deep Port which is home to the typical messy looking commercial port. This is where we spent the first night. At around 5:30 AM we were woken up by the arrival of a large cargo vessel. Once we were up, Frank went to find a suitable place to tie up our dinghy to go in for customs. Frank finally got advice from a seamen next to the coast guard dock, who noticed him motoring around the shore. Frank finally found a small fishing boat tied to a pole in a concrete filled tire. A set of stairs led up to the back of a bunch of stacked containers. After walking around a bit, Frank saw a large pink Administration Building. Frank walked up the stairs to the building and found out the customs office is back across the way behind a bunch more containers. The customs people were straightforward and efficient. However, immigration is not located with the customs office. You have to go back into town and go to the police station to do immigrations. There were also fees for entering, and fees per person from the port authority - which required Frank to climb back up the stairs at the Administration building. Not too expensive, but annoying. Next we moved PatiCat closer to town and dropped our anchor there. The waters were even more swelly and we were right next to two cruise ships. We decided we would just stay for the day here while we did immigration and got our bearings. Then we would move to a better anchorage. The next unfriendly cruiser feature: the only dinghy dock apparently is at the Port Zante marina. They have security guards at the marina, and as soon as we arrived one came by. They told us we could tie up, but there's a $5 US charge. The first time we ever had to pay to park our dinghy in the Caribbean. Worse, the security guards can't collect the money so you have to go to the marina office which is about 500 yards away. Oh, and to make matters worse, the guards are quick to come by when you come in the morning, but there is no evidence of the guards in the afternoon. What are we paying for? 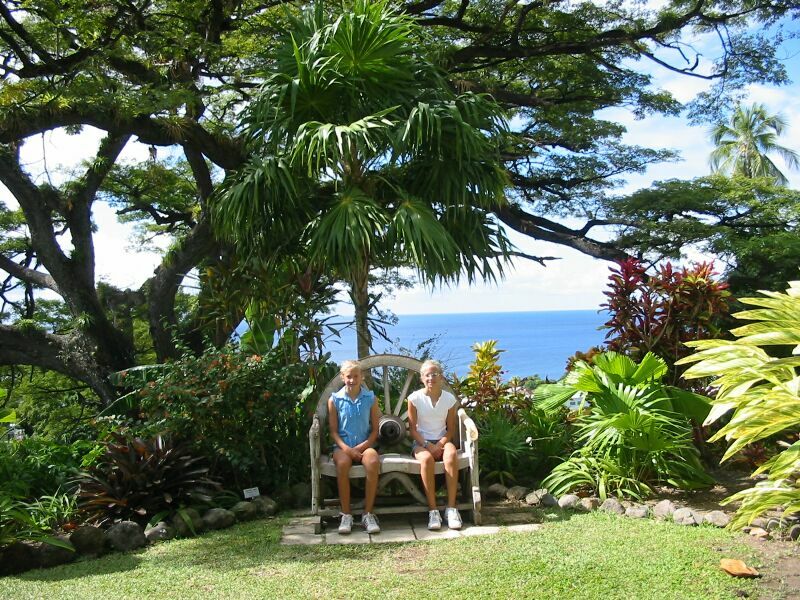 We had to do this every day we visited Basseterre. A major pain. The first thing we noticed when entering the town was that this is an old town. The buildings are close together and of various ages. The next thing you notice is the town definitely caters to cruise ships. Lots of little vendors along the sidewalks, and lots of shops. But, the town is also home to the bulk of the natives here. And its apparent there is a lot of history to the island. The streets are a combination of modern concrete and asphalt and bricks and stones. There are signs of very old buildings like the Anglican church we saw which was probably built in the early 1700s. We found immigrations, and we were soon through with the passport stamping. Thankfully there were no more fees. We had a nice lunch buffet in a small shopping mall, and Frank found a very nice Internet cafe. In fact, they had DSL and it was the speediest connection we've used down here. We then found the Tourism Authority office. Here we met the new Director of Marketing for St. Kitts Tourism Authority. 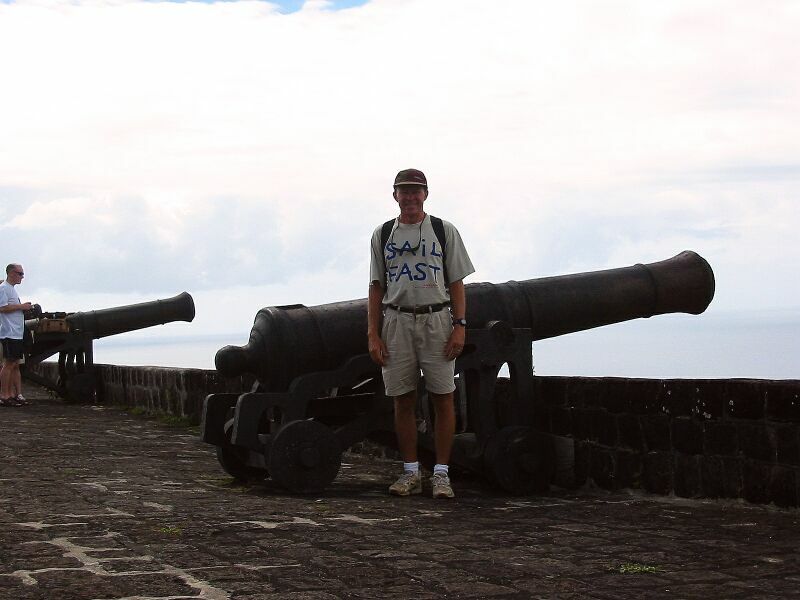 He gave us an enthusiastic review of the main attractions for St. Kitts and asked for our feedback on the island - which we are providing through this write-up. He and his associates were very helpful both on this day, and later on another day when we needed some other tourist advice. We paid our dinghy fee, and weighed anchor to move PatiCat about 4.5 miles over to a place called White House Bay. There were some plantation estate ruins and a house ruin on the coast. We supposed the house used to be white. This side of the island (the SE) is more arid with cactus and bushes around. There were also cattle grazing nearby on shore. But, the anchorage was protected and the water was nice and flat. The water was clean and clear, so running the watermaker was no problem. Here is a picture of White House Bay from the road (yes, that's PatiCat in the bay). The next day, January 16, we took the dinghy all the way over to Basseterre (4.5 miles) and parked in our expensive reserved dinghy spot. We went straight to the main circle where taxis were parked and found a taxi for a taxi tour of the island. We made sure to tell the driver we were NOT with a cruise ship and we wanted a more relaxed tour. The cruise ship passengers get a VERY quick 2.5 hour tour of the island - we saw taxi drivers passing us by at 90 mph, and the tourists would literally run through the exhibits with their video cameras (so they could view what they missed later). Instead, we had a 5.5 hour relaxed pace and saw most of the best areas to visit along the way. A quick summary of our first stops: sugar cane fields, the place where the first govenor was buried near an old Anglican church, Bloody Point (the place where 3000 Carib indians attempted to retake their island from the Europeans), Caribelle Batik (a beautifully landscaped estate with a Batik clothes manufacturer and store), and the most important - Brimstone Hill. Brimstone Hill was recently made a World Heritage Site because of its historic significance and the quality of the site. 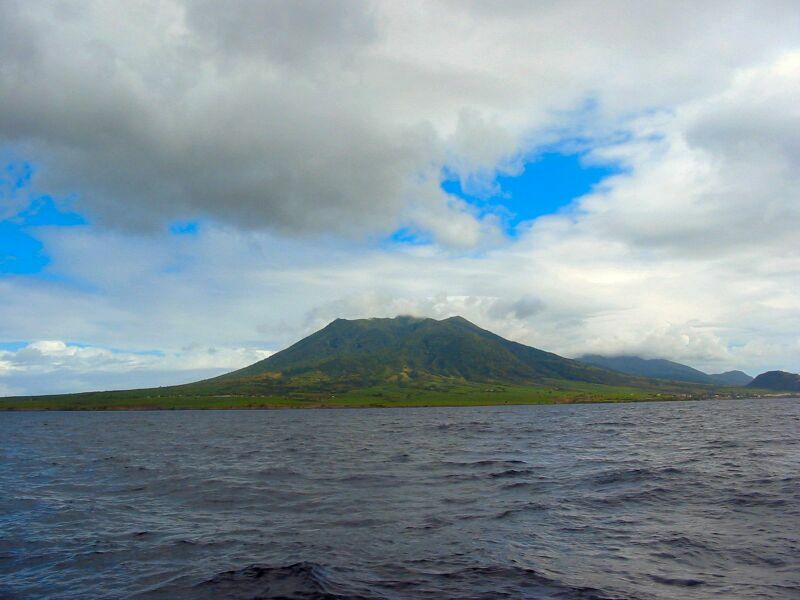 It sits on top of a volcanic protrusion on the side of the otherwise flat portion of the island below the larger volcanoes. It's still about 1000 feet tall. On the top is a wonderful old British Fort built around 1785. It is most impressive because it appears to be impregnible to attack from the conventional methods of its time. 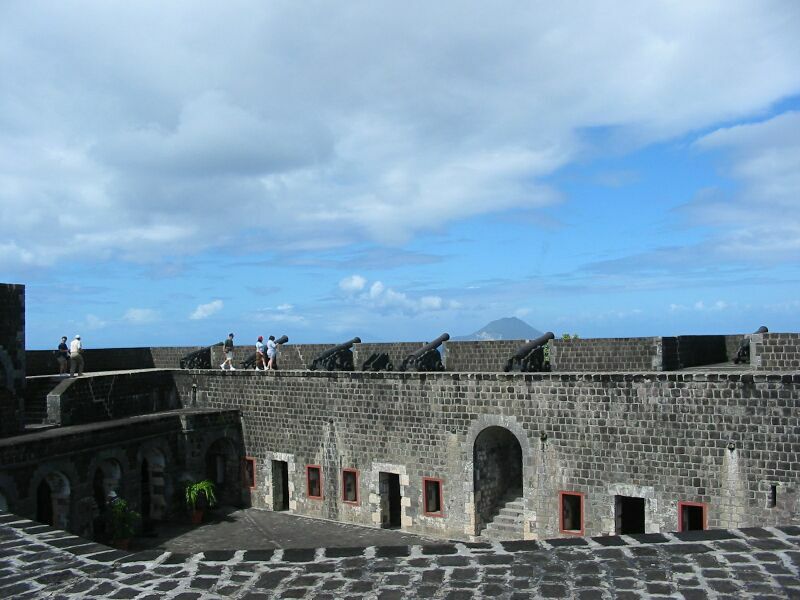 It has large cannon encircling the entire fort, with an amazing view of the Caribbean Sea. On a clear day you can see: Statia, Saba, St. Martin, Nevis, and Montserrat. We had a great time viewing this amazing fort. After the fort we went completely around the island. We went through old towns and villages where few tourists ever stop and saw the natives in their own environment. We saw numerous primary schools all along the way, with kids in their uniforms. There were dozens of sugar cane mill ruins, and probably dozens more we didn't see. At one point in the 1800s nearly every one of the hundreds of plantations had a sugar cane mill. We stopped at a hotel called the Golden Lemon which is located at a point on the NW coast where the Caribbean and Atlantic Seas meet. We also stopped at a place called Black Rock. An amazing site of volcanic rocks formed by lava carved over the decades by the Atlantic ocean. We continued all the way to the SE side of the island and drove past PatiCat parked in White Bay. We stopped at a bar and restaurant called Turtle Beach Bar. This is where we had a late lunch. 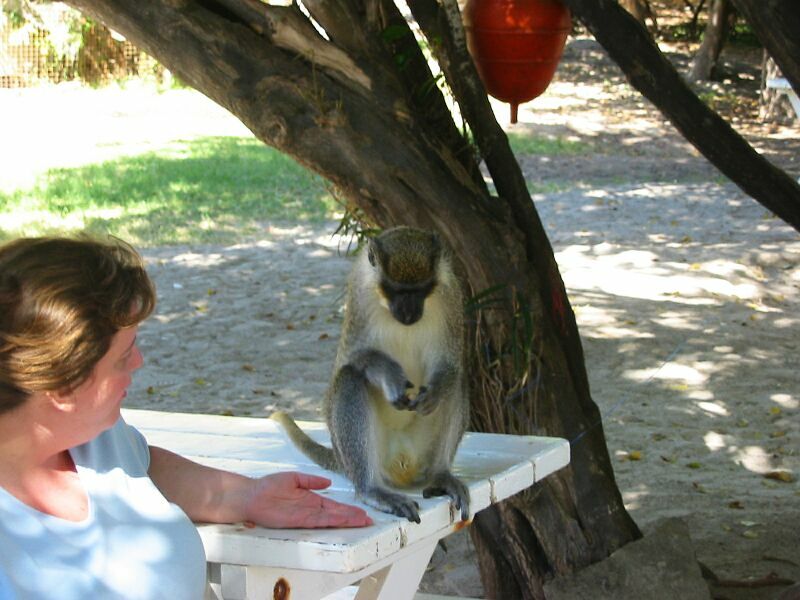 We were fortunate to arrive while a green monkey was still visiting for some free handouts. We enjoyed a leisurely lunch and walked around the beach. 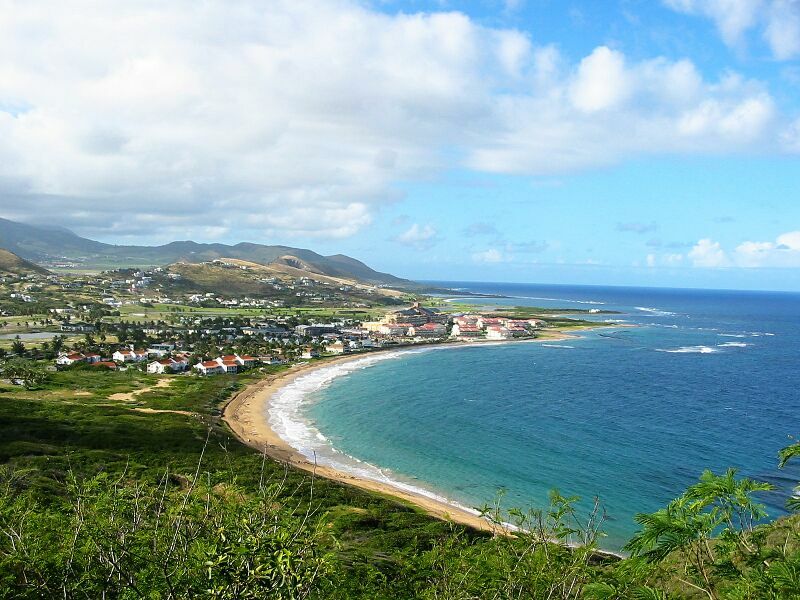 One thing we noticed about St. Kitts - there are hardly any real sandy beaches to relax on around the island. There are a few, but hardly any where you can anchor your boat and enjoy the beach nearby. White House Bay is calm, but the shore is lined with rock - no sandy beach. Leroy, our taxi driver, came back after our lunch and drove us back into BasseTerre. Leroy helped provide us with some pointers on things like laundry, grocery stores, etc. On the way back, we took a picture of the new Mariott which will be opening in February. Finally we returned to BasseTerre and paid Leroy. Frank dropped by the Internet cafe and the girls did some shopping. We found a small bookstore, but there wasn't a good selection. We made arrangements for a rain forest hike the next day with Greg's Safari. They weren't certain Frank could do the full-day hike to the volcano summit as they had only one other customer, but told him to call back early the next morning. The dinghy ride back to the boat was not fun as some waves had built up with the winds...it was a bumpy wet ride. The next morning, on January 17, we moved PatiCat back to Deep Port so we wouldn't have to do the long dinghy ride. We brought our laundry to shore and Karen called to have it picked up by the laundry service. Frank called Greg's Safari and got disappointing news. Not only were they unable to do the full day hike, but they decided they wouldn't do the half-day hike either! There wasn't a big cruiseship in so they decided to take a day off. Sigh. Frank tried another rain forest guide, but he was already on a hike with customers with his cell phone. So, we decided to go back to the boat and do home schooling. Much to the girls' displeasure. After getting our laundry back, we moved back to White House Bay. By the way, the laundry service was very nice to drive and pick up and drop off our laundry. And the cost was very reasonable. We got word from Hotel California that they would be arriving that evening or the next day. The next morning they said they arrived in Deep Port during the night, but upon arrival their oldest son Collin dropped the anchor bay door on his big toe and it was smashed and cut pretty bad. It was too swelly when they arrived, so they chose to wait until the morning to take him to the doctor. They waited too long for stitches, and he had no broken bones, so they applied a bandage and prescribed some antibiotics. Cost for the doctor visit? $15. Hard to believe compared to US prices - that visit would have cost $200 easily. Sheesh. On Saturday, January 18, around mid-morning, we noticed a very unusual thing. Frank heard some shouting on shore, and noticed a bunch of men in camoflauge outfits and automatic rifles (AK47s maybe?). They surrounded a nearby car and hauled out three young men in t-shirts with gold chains on their necks. They handcuffed the young men and then did a bunch of strange manuevers like they were surrounded by an enemy. Frank's initial impulse was to call the coast guard or police by radio and report it, but after keeping the kids inside the boat and watching with the binoculars he concluded they were weekend warriors or National Guard practicing. They eventually packed up in the car and a pickup truck and drove off. Weird. Later that night, Hotel California arrived in White House Bay. During the day we did more home schooling, boat maintenance, and book reading. We didn't get to visit with Hotel California until Sunday evening as they were tired from the previous night, and did church and a taxi tour during the day. On Sunday, January 19, we took the boat out for a short sail to empty our holding tanks in deep water. Then Frank did some snorkeling around White Bay. It was actually pretty good. Afterwards, we went over to Hotel California and enjoyed visiting with them, playing some games, and having a nice long chat. Early the next morning, Monday, January 20, we weighed anchor, moved over to Basseterre briefly to get a boat pass (yet another hassle) at the customs office in order to go over to Nevis. It only took 5 minutes thankfully. We had a nice short sail - about 1.5 hours - over to Nevis.